Winston Churchill once said “You make a living by what you get. You make a life by what you give,” and Don Case has made a life. In 2001 the phone rang in Don Case’s office. When he answered, I made a request. Would he join the board of directors for a new nonprofit clinic, The Dental Center of Stamford? There was no hesitation. He immediately said yes and within a short period of time he accepted the position of chairman. Don was just following his already established commitment to help where he could, especially in oral health care. He led the Dental Center and when it was time to merge with CHC, Inc. he graciously accepted a position on that board and became the Fairfield County representative. For years he was attending staff and then division chief of dentistry at both St. Josephs and Stamford Hospital. Often he is called to be part of the team and does reconstruction on accident victims. 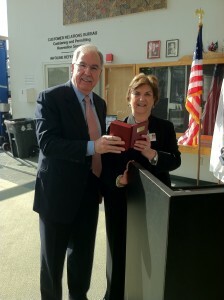 Presently, he serves the community on the Board of Senior Services of Stamford and on the Stamford Police Foundation. We think that is terrific but the reason we are here today is to honor Don Case because of his commitment to giving; providing our patients with specialty dental care that is frequently inaccessible to them. He provides care for many of our patients through a referral process and is available to our dentists for consultation. Those patients that come to our clinics can smile today because of Don Case. As the committee of the Stamford Oral Health Collaborative met to determine who would be the first Stamford Oral Health Champion, Don’s name was the first on everyone’s list. Recently, Don was listed in Stamford magazine as a Top Dentist. According to the magazine the company surveyed dentists In Fairfield County who are members of the American Dental Association, asking each one,”If you had a patient in need of a dentist, to which dentist would you refer them?” Don came out on top. Don, as Churchill said, you are making a life by what you give, so on behalf of the Stamford Oral Health collaborative and the people we serve, thank you. I am so pleased to present you with a token of appreciation; you are the Stamford Oral Health Champion, 2012.